Even since I started blogging in 2008, I've been fortunate to meet some really cool people who share the same passions. To think of it, none of it wouldn't have happened if I didn't commit myself to taking pictures of everything I eat! Recently, I was contacted by Ricky Shetty, who runs the blog daddyblogger.ca. Essentially, he documents the trials and tribulations of being a dad. Very cool, since most blogs out there are mommy-run and related. Good to see a dad in action! Anyways, he wanted to meet up as a form of networking and since he mentioned lunch, I was game. 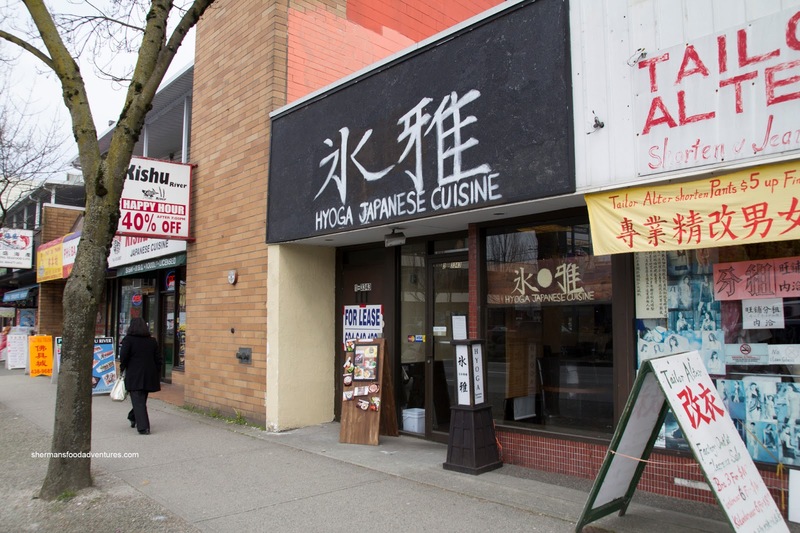 I suggested we try Hyoga on Kingsway because it is one of the rare Japanese joints that is run by actual Japanese people. We got a few things to share starting with the Assorted Sashimi. Although small in portion size, it made it up in quality and presentation. We liked how it was served atop an ice ring, which kept the slices cool as we ate. 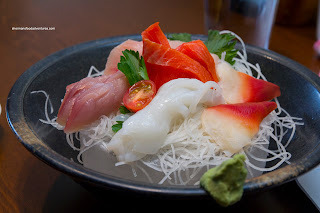 It consisted of 2 pieces each of hamachi, ika, hokkigai, salmon and tuna. The nice sheen and neutral smell indicated freshness (as fresh as flash frozen fish can get). Next up was the Fire Red Dragon Roll consisting of unagi tempura and cucumber on the inside with smoked salmon, avocado on the outside finished off with a spicy mayo concoction. The roll wasn't exactly large in size, yet again, it was constructed with care. I found the sushi rice to have a nice chewy texture with a hint of vinegar and sweetness. There was just enough crunch from the unagi for a textural contrast. However, there was far too little unagi to make any impact. 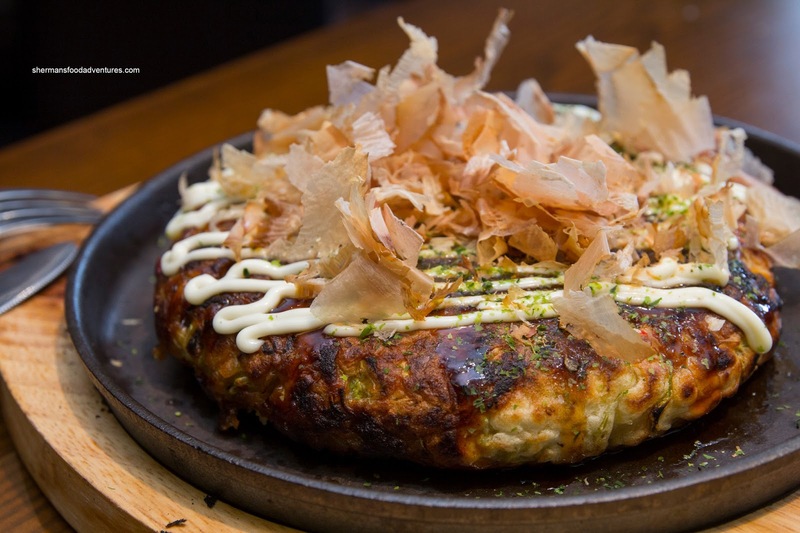 Lastly, we shared the Pork Okonomiyaki which was large and quite thick. Hence, it was on the denser side and slightly lacking in moisture. However, it was panfried well with plenty of body and meatiness. I would've liked to see some pickled ginger to go with this though. 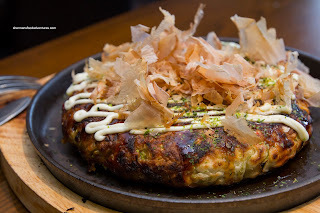 From the items we tried, it was pretty clear that the food was legit (Ricky lived in Japan for a year). 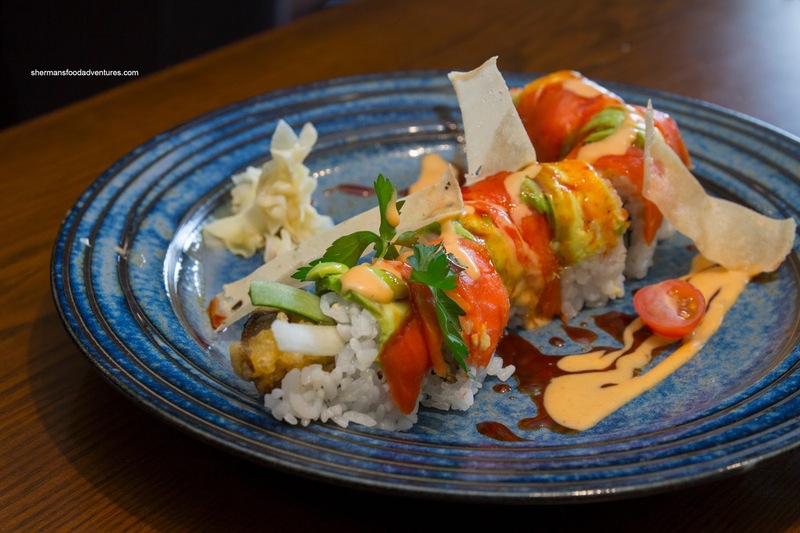 Give it a try when you're in the area.